Nope, nothing scary here. Who would have a problem hanging out in a tin can being dangled a few thousand feet below a blimp? I’m not really sure what the propeller is supposed to do. Are they saying there is actually an engine in the capsule? 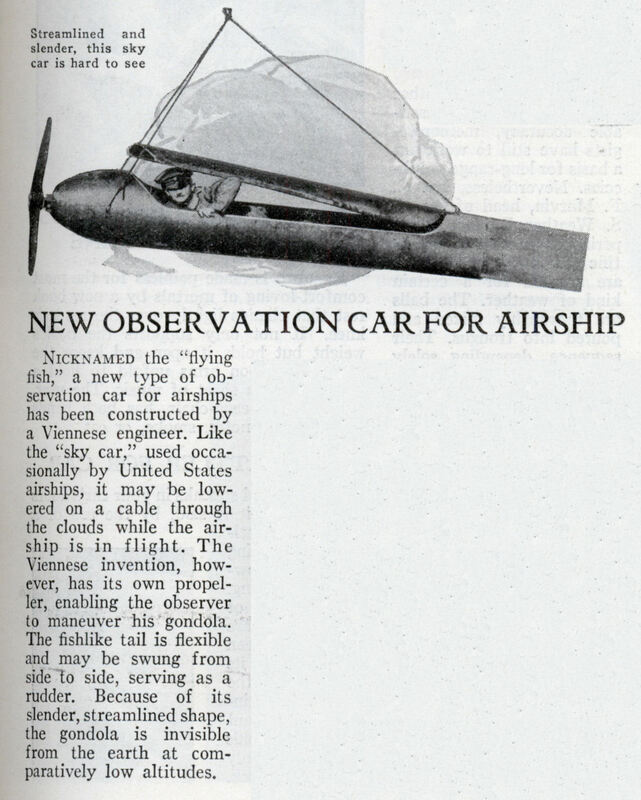 Nicknamed the “flying fish,” a new type of observation car for airships has been constructed by a Viennese engineer. Like the “sky car,” used occasionally by United States airships, it may be lowered on a cable through the clouds while the airship is in flight. The Viennese invention, however, has its own propeller, enabling the observer to maneuver his gondola. The fishlike tail is flexible and may be swung from side to side, serving as a rudder. Because of its slender, streamlined shape, the gondola is invisible from the earth at comparatively low altitudes. 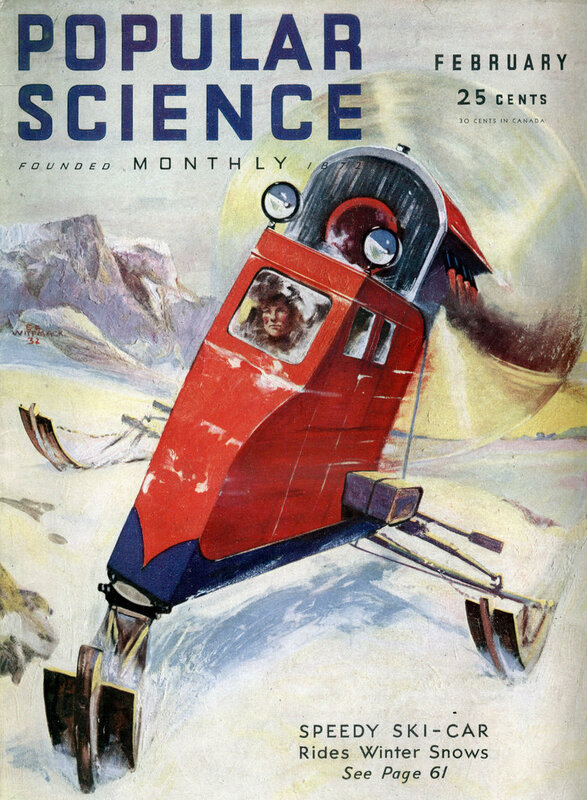 I read in a book titled “Giants in the Sky” that indeed sailors hated riding in the sky car. The cable was so long guys could forget there was a dirigible above them. It probably wouldn’t be under a blimp though, but a dirigible. I’m not really sure how much maneuvering you could actually do seeing how it’s a giant pendulum. You’d probably make a fortune today if you could market it to the hang-gliding crowd. There’s a scene in the old Howard Hughes film from 1930, Hell’s Angels, that includes a slightly different version of this. A German Zeppelin was spying on London from above the cloud deck by dangling an observer in an ‘observation car’ on a long cable that extended just below the clouds. Of course, when they needed to escape from the avenging RAF it took too long to reel it back in and a simple expedient was found in the form of wirecutters. Part of the hazards of early spycraft. It strikes me how little information is in some of these old blurbs. What is the name of the “Viennese engineer”? How to reel it in and out? Has this thing actually flown? If so, when? Where? How well did it work? Kudos to Kris for referencing Hell’s Angels. I would guess the propeller was related to keeping the car level and facing forward. Except there’s no real vane at the back to orient it, so maybe I’m wrong. So how did Hitler get into the thing? The German sailors and soldiers and their American counterparts did NOT hate riding in the spy basket. The Germans especially volunteered for duty. Why? Because when making the 10-hour round trip from the German shore on the North Sea to England it provided them the opportunity to smoke! The smoking lamp, naturally, was always out in a hydrogen-filled airship. five “spy baskets” in the form of their F9C Sparrowhawk biplanes. These were what the airship used to see beyond the horizon and below the clouds. I’m afraid whomever dreamed up this notion of an observation for dirigibles in the 1930s was about 20 years too late. OK, never having served on the Akron or Macon as I said I was quoting from the book that I cited about crewmen on the helium filled Macon. If you had really read the article from 1932 it doesn’t say that the concept of having an observation basket is new but rather a new “type”. But you knew that.